Spitting Pig are UK wide specialists in the field of Coleraine hog roasts and slow roast catering, using their national network of local franchises to combine on the ground local knowledge of the communities being catered to and an eye for the best local produce with the more than twenty years of experience in the field that the founders of the company can bring to every new venture. Spitting Pig Northern Ireland are your local specialists – experts in hunting down the best local providers of the highest quality pork, beef, venison and game, from a hog roast in Coleraine to a Newry hog roast or a Armagh hog roast and they know your community well enough to provide the catering package you need at the price that suits you best. So what is it about a hog roast that has seen slow roast catering sweeping Ireland from Coleraine hog roast to Newtownabbey hog roast? It’s hard to put it down to any one factor but the simple fact of it is that there is something just a little bit special about spit roasted meat. While catering is most commonly a hidden process, food cooked and prepared out of sight (or, worse still, off-site ready to be reheated later!) and only presented when it is time to serve up, the hog roast in Coleraine turns the act of cooking into a multi-sensory spectator sport. From the moment a full hog or a side of beef is place on the spit of the slow roast machine you have something for your guests to marvel at. Better still just as soon as the steady, even heat starts bringing a warm glow to the underside of your cut of meat, your guests will start to receiving wafts of the heady, chickory infused aroma of pork (or beef or venison or chicken…) gently browning, crackling, cooking through to a delicious, tender perfection. Place a Newtownabbey hog roast machine at the centre of attention at your event, party or works outing and you will very soon find the sight, the smell and, the anticipation of, the taste of it will soon be drawing in your guests like the Newry Hog Roast Effect. And of course that’s where the coup de grace lies the taste of it. As they say, the proof of the pudding is in the eating, and you can not, I repeat not, beat the simple, back to basics, tried and tested purity of turning a cut of meat on a slow roasting spit for bringing out the best of the natural flavours juicily infused in an animal’s flesh. The Spitting Pig Northern Ireland team source the best local meat, giving their customers ample choice between the simple and down to earth ‘pig sandwich’ to sides of beef served with horseradish, turkey served with seasonal sage and onion or cranberry, venison or chicken. More than that they also offer a range of catering styles, each packaged to suit the needs of the customer, from a stand up, first come, first served buffet (and in spite of the inevitable jostling to be at the head of the queue when the much anticipated meat is served, the even cooking method of the slow roasting machines ensures everyone gets the best cut of meat) right through to a sit down several course meal, with side dishes, desserts and vegetarian options. 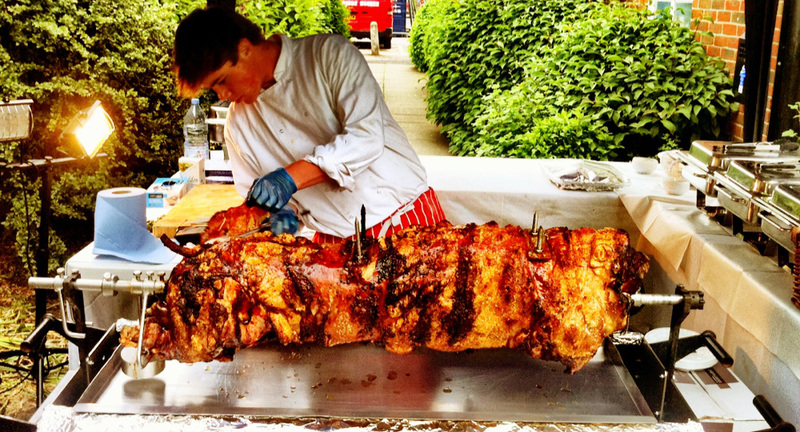 Another factor that has drawn many people to seek out hog roast machines as the ideal solution for catering at their event or party is that using a hog roast machine to cook your food to catering standard is something anyone can do. With just a little training anyone can take on the massive task of cooking a whole hog or side of beef and ensuring that it is done to perfection because, with the latest slow roast machines, the meat is practically cooked for you. The Spitting Pig Northern Ireland use only the best of the latest hog roasters, as you would expect of a company with over twenty years experience of slow hog roast catering, but they are willing to share these with you, the customer. 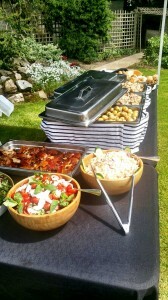 Rather than taking catering out of your hands we at The Hog Roast Northern Ireland are more than happy to empower you to wow your guests with your culinary skills. We will hire out a machine, your choice of meat, even side dishes if you need them, as well as telephone support if you feel you need it, recipes, tips and suggestions to help make your experience of catering for your guests with a glorious hog roast memorable in all the right ways. Just as if we were catering for you, we will provide you with the package that suits your needs and your budget, whatever you need, and, if you get particularly attached to our slow roast machine, we can even include part of the cost of the hire in the cost of selling the machine on to you. As if that weren’t enough we will also deliver the hog roast machine to your door and collect it when you’re done, which can be in as long or little time as you choose. With the hog roast machines they have hired from us other customers have been able to use the sale of pig sandwiches and the like to help subsidise their event, more than making back the cost of the hire, and yet others have bowled over family and friends by suddenly demonstrating a level of culinary skill that no one would have previously suspected them of having. Hog Roast Northern Ireland are happy to put the power in your hands, whether you want to impress your guests or make a much needed bit of revenue for your event, all you need to do is tell us what you want and we can make a package to suit you. But what can we do when we cater for you? Hog Roast Northern Ireland has a dedicated team who can bring all the skills of great table service to any occasion, from weddings to business events, from private parties to bar mitzvahs, taking on everything from the cooking and the serving of your food to dealing with the cleaning up at the end. 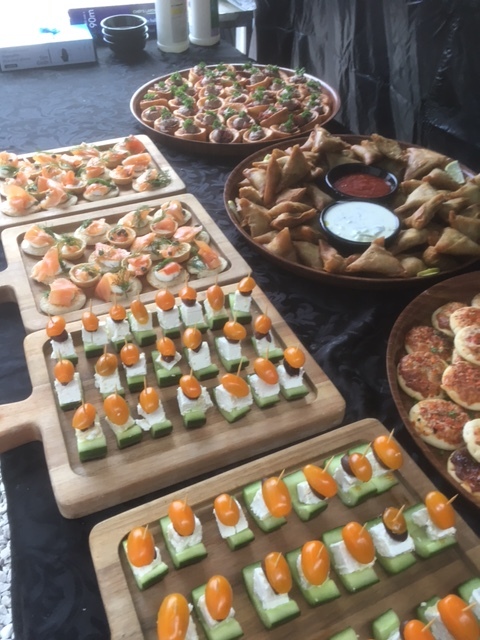 We’ll take on the hard work that goes into the catering for your event so all you and your guests have to do is concentrate on enjoying yourselves. 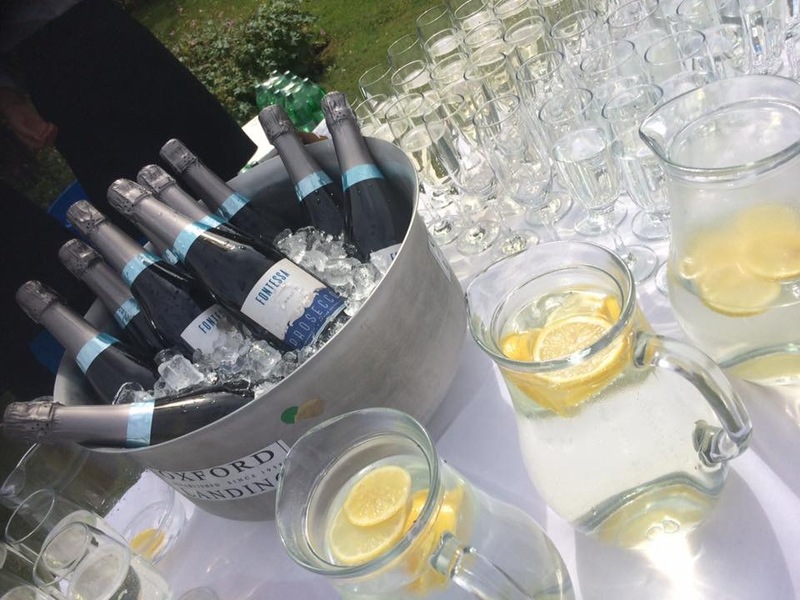 We can offer silverware, table service, several courses – just choose a tailor made package to suit your event. With each package we can offer a different variation on our top grade menus which can take your guests’ palates from the wholesome and simple mini-pizzas and 100% beef burgers to the exotic crispy asian salads or tiger prawns with lemon mayonnaise, and from the homely spit roast chicken with stuffing and homemade onion gravy to the indulgent meringue nests filled with strawberries and passion fruit cream. The catering options can take you to a world of sheer extravagance; beginning your meal with an entrees of canapés to be followed by starters of smoked salmon, soup, salad nicoise or parma ham and on to a main course which may include our legendary spit roasted meat, from pork with apple sauce and stuffing to spring lamb with rosemary and sea salt rub or whole ribs of beef in homemade red wine gravy with good, old fashioned Yorkshire Puddings and side dishes including new potatoes straight from the garden, seasonal local veg or tasty jacket wedges. All this is followed up by a choice of desserts, from the gooey indulgence of sticky toffee pudding, cheesecake and chocolate torte, all washed down fresh coffee or tea and and mints, if you should choose, to cleanse your guests’ palates when they’ve done feasting themselves. 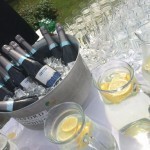 What’s more, unlike the short cut taking antics of some other caterers who are all too ready to reheat pre-prepared meals, all food will be cooked and prepared fresh on site, just as you would expect from a company which specialises in show-stopping catering cooked before your guests’ very eyes. So the Hog Roast Northern Ireland team is there for you, with all the expertise of a national company with over two decades experience of catering to guests just like yours and with the on the ground local knowledge to provide exactly what you are looking for at a price that will suit you. 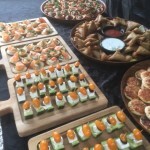 Whatever you want from us, from show stopping cuisine, to easy going buffet, from the hire of hog roasters to impress your friends or make revenue for your event and from sit down, silver service, all the bells and whistles to make your guests feel like a million dollars, catering we can cover the lot. We look forward to hearing from you!